Spring Safety Tips. Yes, spring safety tips. It is not a typical July in California’s Sierra Nevada. The snow pack is so dense that it’s like early May out there, but with July temperatures. The hazards are many. They’re out there every spring, but the hikers aren’t, at least not in great numbers. But with July and summer temps upon us, people want to get out and explore. This year, they’re finding downed trees, snow obscuring trails, slippery snowfields to cross, and very, very swollen rivers and creeks. Some streams are running so high that they cannot be crossed safely, and hikers need to be ready to turn around and call it a day if they encounter such conditions. Streamflows can increase as the day heats up, too. Throughout the mountains, a particular danger is posed by “snow bridges,” where snow that typically might have melted by now covers a stream running underneath, making it “invisible” and capable of easily dropping you 10 to 15 feet into an icy torrent. Hikers are advised to have good “route-finding skills” and to check updated trail conditions before starting out. They also should carry maps, compass and/or good GPS equipment, and know how to use it. Cellphones can be invaluable in an emergency, but hikers should not expect cellphone coverage in remote mountain areas. As of July 4th Stanislaus National Forest Ranger Station in Hathaway Pines is not reporting closed trails, opting instead to put out appropriate advisories about the abundant snow on trails in the high country and relying on hikers themselves to take necessary precautions and preparations. Cell phone service is spotty in the mountains, and that it can take several hours for Search and Rescue to arrive if called. You have got to be prepared to deal with an accident or injury without help for a lot longer than you think. This is where we plead with you to remain alert. Please, please read our safety tips, even if you are an experienced hiker. Refresh your memory. Forward them to your hiker friends. Always carry the Ten Essentials. Brush up on your wilderness first aid skills. Be over-prepared this year. Hike extra smart this year. Unlike our lower altitude trails in the Camanche-Pardee segment, this trail, at 7200′, is buried right now under mounds of snow. But it’s a great trail to visit in mid to late summer. A nice 9.2 mile round trip is in store for you, with a couple challenging ridges to conquer. A less challenging option is the meadow meander, offering plenty to occupy an explorer, a family with children, or birdwatcher. a kiosk, one of several installed in the high country in 2010. Very sturdy! 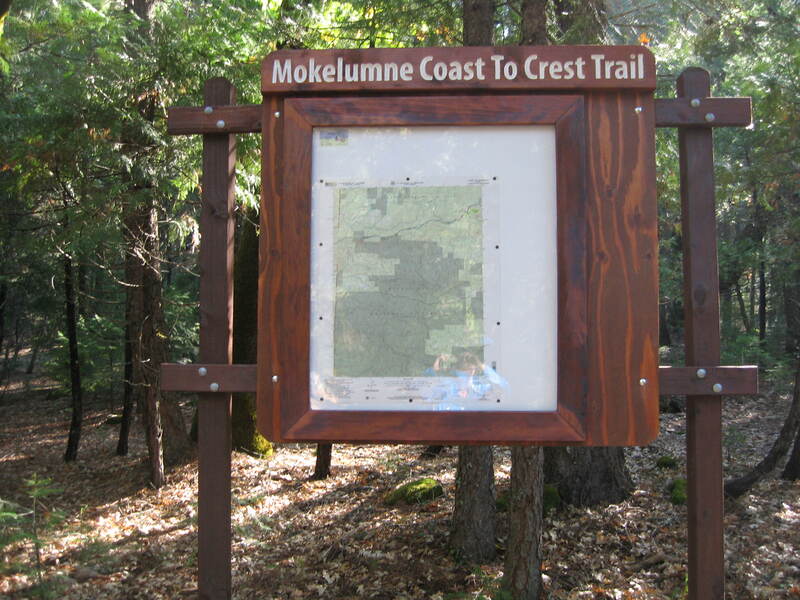 This trail works as a day hike or as a jump off spot to head into the Mokelumne Wilderness (get a permit first before going). We’re thinking of calling it the High Country Meadows trail, but if you have a better suggestion, just holler. Details at the link.